Includes the classics "Sweet Emotion" and "Walk This Way'"
Three of Aerosmith's classic '70s albums were reissued for 2013's Record Store Day event in April. 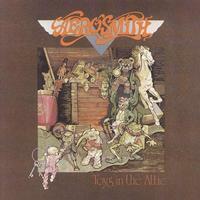 The band's 1973 self-titled debut, 1974′s Get Your Wings and 1975′s Toys in the Attic were all remastered for vinyl. Wow! One of the best Remastered Albums I have ever heard! This album is Pure Awesome! Fantastic! Have owned these Areosmith re-issues since they were first offered, and the comments on the first two titles hold true (no surprise) here as well. This was never a reference-quality, "clear-sounding" rock album compared to some others of the era...it has a somewhat "busy" mix and the top end was always a tad soft, etc. But (again), unless you already have a pristine copy of this, purchase one of these before they're gone. As I stated on the reviews of the first two albums, the vinyl was quiet and clean. I really love old Aerosmith! !,and have owned this album on old LP (wish I still had it), cassette and CD. So maybe I was expecting too much when I saw this album finally go onto re-mastered virgin vinyl. Maybe its the original master source tape? I don't know. But this version sounds kind of muddy, lacking definition,far away with muted cymbals,etc.etc. you get the picture. But at $24 bucks and the good originals impossible to find! there you go.